Last week I wrote about 10 ideas that, if implemented with discipline, have the potential to make you a millionaire. This week I am going to show you how I have implemented several of these ideas in the form of my investment strategy. I hope that by sharing how I have implemented these ideas you can do the same and successfully build the wealth you desire. Start investing as soon as possible with as much as possible into low cost mutual funds that build a strong wealth base. As your income grows, continue to build your gross investment amount as well as the amount you invest as percentage of your income. Make all of this systematic by setting up automatic transfers and investments that ensure you are paying yourself first. Realize the impact of compounding by automatically reinvesting dividends. Last step, watch the net worth statement grown beyond what you ever imagined possible. How does this look in practical terms? How have I applied this, in what amounts do I automatically invest and into which investments? We can start with the investment vehicles I use and in which priority order I have chosen to fund each vehicle. Now, let's look at some of the details of how I go about funding each of the items above. Fully Fund Tax Advantaged Accounts (Pre-Tax). My first priority is to fully fund tax advantaged retirement accounts. I first fund 100% of the maximum allowable to our 401(k) and IRA accounts. These accounts are automatically funded by, 1) direct paycheck withdrawal for the employer sponsored 401(k), and 2) by direct withdrawal from our checking account for the IRAs. We have selected low cost index mutual funds as our investment choice in each account. We have been successful at fully funding each of these accounts from our second full year of employment after college. Fully Fund Tax Advantaged Accounts (After Tax). Next, I fund our 401(k) account to the maximum extend possible on an after tax basis. The total contribution limit for employee and employer contribution on a before and after tax combined basis is $52,000. We contribute enough on an after tax basis to meet the $52,000 limit on myself and wife's account (including our company's 8% match). Again, this is done automatically from paycheck deductions. The deductions must be adjusted each year as our salaries grown but we set the deduction amount at the start of the year and forget about until next year. Even with these contributions on an after tax basis, we benefit from these contributions in that our earning grow tax deferred. If you are contributing early and often these tax savings can add up quickly. It took us several years of working and increasing our salaries to get to a point where we could meet the maximum total contributions on an after tax basis but we are now doing this each year. As Your Income Grows Start Funding a Taxable Low Cost, Low Maintenance Mutual Fund Account. After taking full advantage of tax advantaged retirement vehicles, I fund two taxable low cost mutual funds. One is a Total International Stock Index Fund and the second is a Target Date Retirement Fund. These are both low cost and low maintenance. 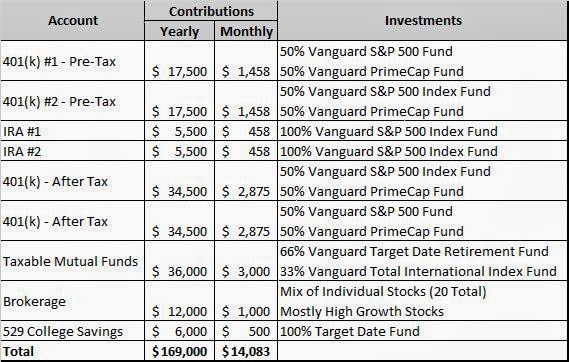 I have $2,000 per month directly debited from my checking account and invested in a Vanguard Target Date 2040 fund. This fund adjusts the allocation of stocks, bonds and cash over time to account for a retirement goal of 2040. I like this option since allocations are changed automatically over time with no intervention from me. I have $1,000 per month directly debited from my checking account to fund a Vanguard Total International Stock Index Fund. I chose this fund to provide some diversification since much of my investments are in the U.S. securities. I first started funding these investment in 2008 when our incomes had grown to a point where we were beginning to stack up some cash that was going un-invested. With these first three categories funded in the easy to maintain way I have described, you will be on your way to a substantial wealth base that takes very little time to manage. Your time is an extremely valuable asset and investing in low cost, low maintenance mutual funds can ensure you have ample time to start considering investments in individual stocks as I will describe in the next step. With a automatic system in place to build a substantial wealth base, start funding a Stock Brokerage Account to invest in individual stocks. With the above investment since in auto-pilot mode, I now move $1,000 per month into a brokerage account. I move this money automatically from by checking account, however, I do not make automatic investments into individual stocks. I takes lots of time researching companies before making investments in individual stocks. As I build a cash reserve in my brokerage account I look for the next best investment opportunity. When I find the right company, I have funds to make an investment. I sometimes go 6 months without an investment in an individual stock. I can afford to take this long since I have a substantial monthly amount of investment dollars being contributed to the items I have listed above. Most of the individual stocks I invest in are high growth companies that have an early mover advantage. They are also very high risk investments. This individual stock portfolio is the best return on investment portion of all of my investing dollars but it also takes the most amount of my time and attention. This is my "get ridiculously wealthy" bucket of money. it is also the portfolio that is the most interesting to manage and affords me the best opportunity to continue to broaden my understanding of how different business and industries work. I plan on balancing this portfolio a bit with some more stable and established companies that have dominating positions in high return on capital employed industries. Fund a modest amount to a 529 College Savings Plan. I invest $500 per month into a target date fund to provide some funding for our child's college education. I have not decided yet, if we will increase this amount to ensure we can fully fund a college education. This will probably be a topic of an upcoming post. Finally, move any left over disposable income over to a savings account that can serve as a "rainy day" or "opportunistic" investment fund. With what's left, I fund a savings account that can serve to fund an opportunistic investment in a major broad market downturn or a real estate downturn. I have had the opportunity to use funds from this bucket once during the market downturn in late 2008/2009. This also serves as a reserve fund for major unexpected expenses so the funds in this bucket can fluctuate drastically and I don't worry about that too much. To summarize, I have constructed the table below that lists all of the account I contribute to on a monthly basis and the investments I make in those accounts. This accounts for all of the investments my wife and I make. We have not always been able to contribute the amounts listed in this table. When we first started working we scratched by to maximize our pre-tax 401(k) and IRA contributions. As we progressed our careers, we have slowly and surely worked to the amounts listed in this table. The contribution amounts listed above represents a very large percentage of our combined salaries and rental income. We have attempted to essential live off of the income we made when first starting our working careers and invest almost every penny of each raise we have received since that time. I am interested in your investment philosophies and strategies and how you have translated those into the investments you make each month!